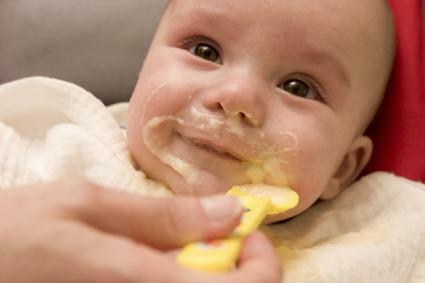 There's no doubt that ready-made baby food is convenient, but it's also expensive. At anywhere from 50 cents a jar and up, jars of baby food can put a big dent in your grocery budget rather quickly. The solution? Homemade baby food! If you have a blender and/or food processor, food strainer, and some ice trays, you're all set! Once you start introducing solids to your baby, you will need to adjust the texture and consistency in a manner appropriate for your baby's age. At this age, foods should be completely pureed and of a fairly thin consistency. Steam fruits and vegetables until they are very soft, and then puree them thoroughly in the food processor, blender, or food mill. To get an extra smooth consistency, press the pureed food through a sieve. Then, mix the food with breast milk, formula, or water in about a one to four ratio of food to liquid. At this age, your baby may only eat a teaspoon or two of solid food diluted with about a tablespoon of water, breast milk or formula in a sitting. Start with a single solid food offering per day and work your way up to more based on your baby's response and hunger. Continue offering your baby about 24 to 40 ounces of breast milk or formula each day. At this age, feed your baby single ingredient purees made from fruits and vegetables, as well as cereals. Consider making organic baby foods to minimize the amount of chemicals your baby ingests. Bring about one inch of water to a simmer in a medium sized saucepan over medium-high heat. Add a steamer basket to the water. Wash and peel your fruits or vegetables, removing any seeds. Cut fruit or vegetables into quarter to half-inch dice. Put the fruits or vegetables in the steamer basket and cover with the lid. Allow the fruits or vegetables to steam until they are soft, anywhere from five to fifteen minutes depending on the fruit or vegetable. Put the fruit or vegetable in a colander and run them under cold water to cool them slightly and stop the cooking. Put the fruit or vegetables in a blender, food processor, or food mill and process until smooth. Strain the puree through a mesh sieve into a bowl to remove any lumps. Introduce foods one at a time and watch for any signs of allergies or intolerance. Your baby will let you know if she wants more food. When in doubt, consult with her pediatrician. Steam foods instead of boiling them to preserve nutrients. As your baby tolerates it, gradually make the foods thicker by adding less liquids. At this age, your baby is ready to explore thicker foods with more flavors. You can also introduce a very small amount of texture to foods. Likewise, you can begin combining foods in purees, and you can even introduce finely pureed meats. Your baby will be progressively eating larger portions of food. Your baby will likely require about a quarter to a half cup of solid foods over two to three feedings throughout the course of the day, as well as around 24 to 32 ounces of formula or breast milk. Your baby will enjoy combined ingredient purees at this age, which you can make by combining two separate purees or by pureeing two or more ingredients together. Make the purees as you would for a six month old, but skip the step of straining the puree through a sieve. This will provide a bit more texture for your baby. Likewise, it is unlikely your baby will require you to dilute purees with breast milk, water, or formula any longer. Follow your baby's lead, using less liquid as he tolerates thicker consistencies. Include meat with a fruit vegetable puree, or make a meat puree by itself and mix it with an existing puree. Boiling or steaming meat keeps it moist, making it ideal for a puree. Cut the meat into quarter to half inch pieces. Cook the meat in boiling water or broth over medium-high heat until it is cooked through (anywhere from 10 to 20 minutes depending on the meat). Alternatively, put the meat in a steamer basket set in a pot of simmering water and allow the meat to steam until cooked, about 15 to 20 minutes depending on the meat and the size of the pieces. Put the meat in a food processor or blender with a few tablespoons of the cooking liquid. Cook legumes thoroughly until they are soft. If you are using dried legumes, be sure to soak them overnight and then rinse them thoroughly before boiling. When the legumes are cooked, drain them and puree them in the food processor or blender with a little water until they achieve a smooth consistency. Make this simple fish recipe for your baby. It will store in the refrigerator for up to three days or in the freezer for up to three months. In a medium-sized saucepan, bring one inch of water to a simmer over medium-high heat. Insert a steamer basket and add the cod and pears. Cover and allow to steam until the pears are soft and the fish is cooked, about 10 minutes. Rinse the food in a colander to cool it slightly and stop the cooking. Puree in a food processor, blender, or food mill until smooth. Apples sweeten the spinach in this recipe. In a medium-sized saucepan, bring one inch of water to a boil over medium-high heat. Add the apples to the basket. Cover and steam for five minutes. Add the spinach to the basket with the apples. Cover and steam an additional five minutes, until apples and spinach are soft. Run the apples and spinach under cool water in a colander to stop the cooking. Put the apples and spinach in a food processor, blender, or food mill and puree. Your baby is ready for bolder flavors and more texture. At this age, she probably has teeth and likes to use them. Giving her foods with more textures will help her learn to chew her foods, while adding a bit of flavor and spice will expand her palate. At this age, your baby may eat as much as a cup of food per day over the course of three meals and snacks. You will also want to continue feeding him breast milk or formula. While the bulk of your baby's food will still be pureed, you'll also want to add in a little of texture. Do this by cutting fruits and vegetables into quarter inch dice and steaming them, and then reserving a small amount of the diced fruits or vegetables to stir into the final puree. Likewise, you can offer finely ground cooked ground meats in the final puree to give your baby something to chew on. Additionally, you can add a little texture by stirring in well-cooked rice or cut up soft spaghetti noodles. Your baby will also likely have developed a pincer grasp, and she will enjoy picking up small bits of food with this new skill. Offer steamed fruits and vegetables cut into a quarter inch dice, as well as small soft raw fruits cut into small dice such as avocados or bananas. Whole small cooked legumes, such as black beans, lentils, or peas also make great finger foods at this age. When adding new flavors, just use a very small amount. This recipe gives your baby just a tiny taste of thyme. In a small saute pan, cook the ground beef, crumbling as you cook so that it has a very fine grind. Sprinkle in the dried thyme and garlic. Cook until the garlic is fragrant, about 30 seconds. Remove the beef from the heat and allow it to cool slightly. Meanwhile, in a food processor or blender, puree the blackberries until they are smooth. Stir in the ground beef/garlic/thyme mixture and serve. Nutmeg adds just a hint of sweetness to this cauliflower puree. In a medium-sized saucepan, bring one inch of water to a boil over medium-high heat. Add the cauliflower and carrots and cover the pot. Steam until the cauliflower and carrots are soft, about seven minutes. Run the vegetables under cool water to stop them from cooking and cool them slightly. Separate the carrots and cauliflower, setting aside the carrots. Put the cauliflower in a food processor or blender with the milk and nutmeg. Puree until smooth. Many of these foods keep well. Store them in the refrigerator for up to three days, or store them in the freezer for up to three months. To freeze, measure food into ice cube trays and freeze them. When frozen, pop the cubes into zipper bags labeled with the food and the expiration date. Then, thaw a cube or two when you're ready to feed your baby. While conventional wisdom used to suggest avoiding adding certain common allergens to your child's diet in the first year, such as dairy, eggs, or nuts, the American Academy of Pediatrics says this is no longer necessary. In fact, their research suggests adding common allergens earlier may offer a protective benefit against food allergies. While most pediatricians no longer offer restrictions on when to introduce certain foods, you should avoid some foods during your baby's first year. Honey presents a risk of botulism in infants 12 months or under, so wait until your child is older to introduce this food. Avoid salt in the first year so your baby doesn't develop a "salty palate." Minimize or avoid processed sugars. Avoid excessively sticky foods (like marshmallows), which present a choking hazard. Avoid large chunks, which present a choking hazard. Avoid nut butters, which present a choking hazard. If you do offer nut butters, only offer a very thin layer. Avoid fibrous foods like celery in purees until your baby is about a year old. Making homemade baby food is an easy and inexpensive alternative to ready made food. Keep the following precautions in mind. If you are tempted to use the microwave, remember that microwaved foods cook unevenly. Be sure you stir the food thoroughly, and check the temperature before giving it to your baby. Wash your hands thoroughly before you begin cooking and preparing your baby's food. Wash all cooking surfaces thoroughly before you begin preparing foods. Wash all fruits and vegetables before you begin making homemade baby food. Peel fruits and vegetables, and remove seeds or pits. If you don't immediately freeze the foods you make, you should store them in an air-tight container for no more than three days. Making healthy baby food ensures your baby eats ingredients you have purchased and prepared yourself made from fresh foods with no additives. When you make baby food for your baby, you can be confident in the knowledge she is getting the best possible nutritional start.